It’s that time of year again!! 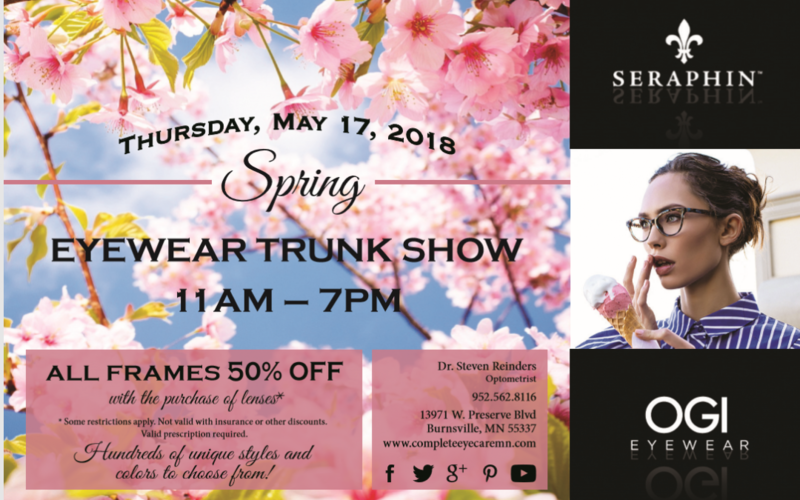 Our Spring trunk show is here! Every frame in the clinic is 50% off with a complete pair of glasses. A complete pair means that your frame must include a prescription in the lens in order to get 50% off. This time we have our rep from OGI/Seraphin joining us and bringing hundreds of frames that we normally would not have in the clinic. So this is your chance to try on many different colors and styles of frames that you wouldn’t normally have access to. Who doesn’t want a new fresh look coming into Spring and Summer? I know I do! This event only takes place twice a year and Jennifer Jackson from Chu Vision will be joining us to answer your questions about Cataracts and Lasik surgery. This year we will be providing cupcakes from Sammy’s Sweets in Eden Prairie! This company has a very special story. The man who owns it is Autistic and it was always his dream to own his own bakery. Click on the Sammy’s Sweets link above to read more about his amazing mission statement in providing jobs to people with intellectual disabilities. We also will have a drawing for a free pair of OGI/Seraphin sunglasses valued at over $500!!!! It’s on May 17th! Its starts at 11 and ends at 7pm. So come on your lunch break or after work! Whatever works best for you! We CANNOT wait to see you there! !